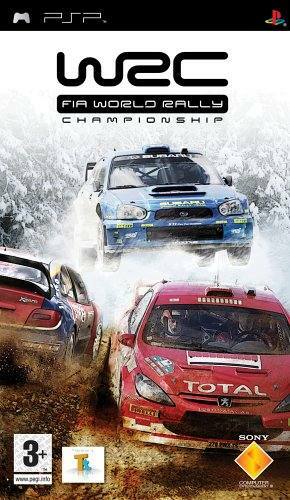 I love the WRC games and was looking forward to this release on PSP. 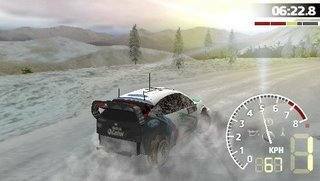 The World Rally Championship series on the PS2 have become the penultimate in rally games and it was hoped that a touch of the magic would transfer itself onto the hand held, which really, unfortunately simply has not happened. At first glance this looks like the WRC that you lovingly introduced to your PS2 console a few years ago, gently placing the disc into the tray and watching as your PS2 smoothly slid its tray shut to let the good times roll. The PSP has a cool little introduction sequence but everything after that lacks a little something. It’s as though the development team (who are different from the proper group), really didn’t know that smart programming would allow for a much more enjoyable experience and just dumbed down everything and then washed out all the textures and colours as well. You do not have access to the cars that the console version does, nor do they look that good. There are damage visuals when you crash but to the best of my knowledge, it didn’t seem to affect the way that I raced at all. 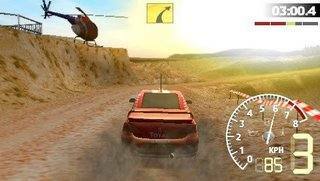 There are only 4 tracks per rally which for fans who want their stages, well you ain’t getting them! Don’t rely on the navigator either as you are as good as dead with mistimed instructions all delivered in a monotone. If they knew that component was going to be as hokey as it is there should have been a line that shrieks “Ohmygodi’mgonnakillusboth”. Multiplayer does exist if you like the idea of taking turns! Or there is the option of doing a number of games on the one console which made sharing understandable. It’s pretty sad and uninspired. I really do recommend you rent this one before buying it as punters I think are gonna to be really unimpressed. Add to this a lacklustre soundtrack with only a few songs on it and you are going to go crazy soon than later.